This Friday (today), and Saturday and Sunday, The Commercial Theater Institute (an organization) is holding its 24th annual Commercial Theater Institute (a seminar/conference). It is quite a remarkable, detailed introduction to the inner workings of Broadway and other commercial theaters. Over three hundred people are attending, including writers, producers, investors, and lawyers. Many of the participants are working on current shows (eg a co-producer of Bridge and Tunnel), some on new projects. Two of the many exciting new projects I heard about are: an attempt to bring Harmony back to Broadway, and a show about Woody Guthrie. I suspect that over the last two decades, most of our successful producers have passed through one or more of CTI's events, as listener, speaker, or both. My own main purpose in attending is to get an up-to-the-minute status report on mounting a production, since I am hoping to begin (soon) some semi-public previewing of my show, HOW TO PREDICT THE FUTURE: An Evening of Science Theater. So far, the CTI seminar has been excellent -- interesting, informative, useful, and very well run. CTI is a creation of the Theater Development Fund (TDF) and the League of American Theatres and Producers, Inc. I've had three short films recently shown at Quick Flick World. Video Blog is posted on the QFW site in the Contradiction collection. Sonnet 65 is on Google Video, and there is a commentary in my blog, "Sonnets By Shakespeare." The Mermaid is in rough cut. (But it can be downloaded even now -- tho' it is quite big. Note: after downloading, delete the final .dat to get an avi file.) It will be posted online soon in a finished version. 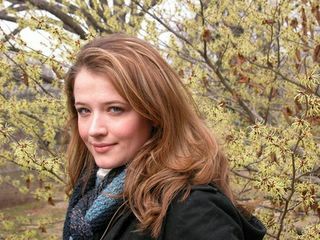 MEAGAN ENGLISH AS "MY LOVE" IN "SONNET 65"